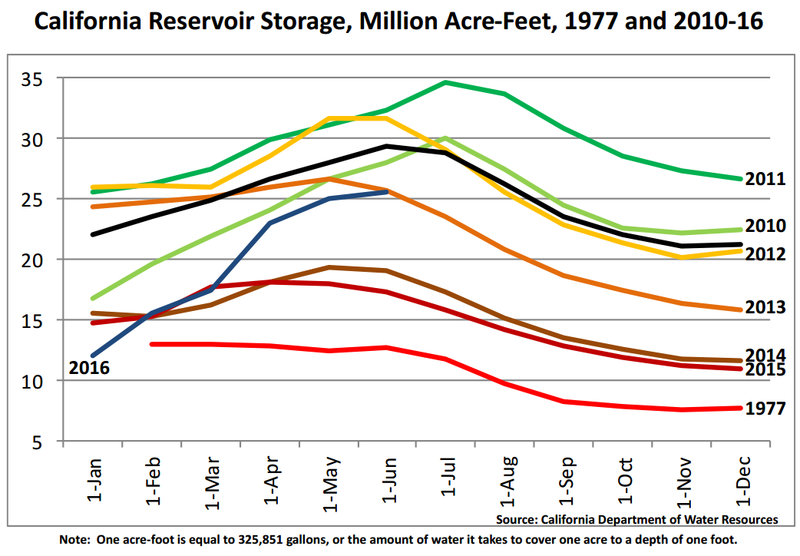 California reservoir reaches storage level not seen since 2013. In May, the West saw the biggest decreases in drought areas, while the Southeast saw the biggest increases, according to National Drought Mitigation Center (NDMC) climatologist Deborah Bathke. A steady improvement in conditions in northern California and western Nevada led to a reduction of extreme (D3) and severe (D4) drought in these areas. “Extreme southeastern California and the northwestern parts of Arizona, Utah and New Mexico also saw changes for the better, with some removal of moderate drought conditions,” Bathke noted. The exception to the West’s improvements was in the Pacific Northwest, where above-normal temperatures, combined with below-normal precipitation, soil moisture and stream flow, led to an expansion of abnormally dry (D0) conditions. “Although drought conditions have improved in recent weeks, projected warmer-than-normal temperatures and climatologically dry conditions during the summer months favor the persistence of drought in northern California and northwestern Nevada,” she said. U.S. Department of Agriculture meteorologist Brad Rippey reported that California’s pace of statewide reservoir recovery slowed during May as high-elevation snowpack mostly finished melting out. The state’s 154 reservoirs gained only about two-thirds of a million acre-feet of water during May, with overall storage dipping from 89% of the April 30 average to 87% of the May 31 average. Despite the slowing recovery, end-of-the-month statewide storage topped 25 million acre-feet for the first time since May 31, 2013, while the total 2015-16 recharge value of 14.66 million acre-feet is 178% of the historical average, Rippey added. In much of the Plains and mid-Atlantic states, Bathke said abundant precipitation during May improved many of the areas experiencing drought and abnormal dryness. “Conditions continued to dry out in the Upper Great Lakes and New England, leading to an expansion of abnormally dry conditions. Much of the Southeast saw a deterioration of conditions during May,” she noted. Below-normal precipitation in Tennessee, northern Alabama and northern Georgia caused an expansion of moderate drought (D1) and an introduction of severe drought (D2). By the end of May, however, only 12.73% of the contiguous U.S. was experiencing moderate drought conditions or worse, compared to 14.56% at the beginning of the month.